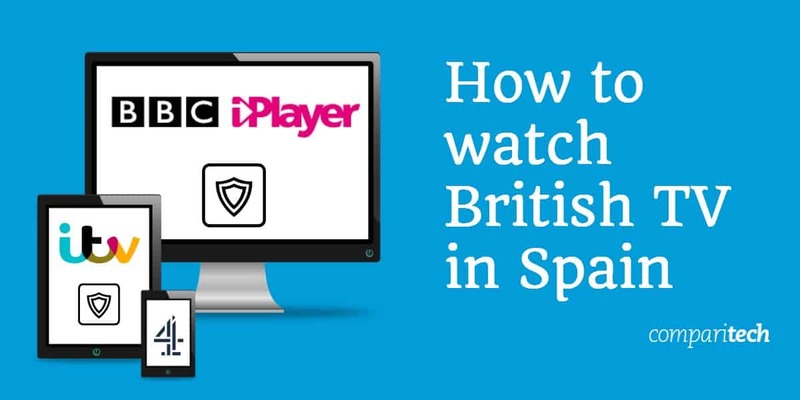 We'll show you how to stream British TV from Spain. Whether it's BBC, ITV, Channel 4, Sky Go or British Netflix you can watch your favourite UK TV abroad if you know how. Most British TV channels, such as BBC iPlayer, Sky Go, ITV, and All 4 (previously 4od), only let you watch their online streams if you are in the UK. As soon as you leave the country, you are blocked from accessing British web video players. This means you’ll have to settle for Spanish shows instead of Eastenders, Coronation Street, or X Factor. Thankfully, you can access British TV online using a VPN. This service will tunnel your web traffic through an intermediary server and replace your real IP address with a British IP address, enabling you to access UK video streaming sites. It will also impose encryption on your connections to prevent your internet activities from being logged or interfered with. In this post, I’ll tell you how to use a VPN to make it look like you are still in the UK so you can watch British TV from Spain or anywhere else in the world. I’ll also tell you which are the best VPN services for the task based on my past experience. Sign up for a VPN from the list below. I recommend ExpressVPN. Install the appropriate app for your device. Open the app, select a UK VPN server, and connect. Go to a UK video streaming site in your browser, choose your video, and enjoy. The VPNs in this list are all very easy to use. However, if you face technical problems, you can contact your VPN provider’s customer support team for assistance. Here is my list of the best VPNs for watching British TV when you are in Spain. ExpressVPN is the best VPN for accessing British TV in Spain. When you are streaming live TV from the UK, especially in HD, you need fast speeds. VPNs have to do a lot of work in order to make your connection secret and sneak past location locks. ExpressVPN performs those tasks while still keeping the transmission rate fast enough to get a continuous video feed without loss of quality. As well as unblocking the regular British TV channels, ExpressVPN can get you into subscription services, such as Netflix (including the UK library), Amazon Prime Video, and NowTV (as long as you have accounts with them). The service includes access to VPN locations in 94 countries, so you can access channels from all over the world, including ABC, NBC, and CBS in the USA. The helpdesk is available around the clock every day of the year via live chat in case you face technical problems. Apps run on Windows, macOS, Linux, Android, iOS, Amazon Fire TV, Amazon Fire Stick, Fire tablets, and certain flashed routers. Browser extensions for Chrome, Firefox, and Safari are available, but work alongside the desktop app. You can connect three devices to the service at the same time. BEST FOR BRITISH TV:ExpressVPN is our top pick for watching British TV from Spain. You get fast speeds, strong privacy, and access to all UK channels, including premium video streaming services. ExpressVPN offers a 30-day money-back guarantee, so you can try it risk free. NordVPN has servers in 62 countries, including the UK, and can unblock entertainment sites across the globe. This service enables access to all of the regular UK video streaming services as well as pay systems, such as NowTV, Amazon Prime Video, and Netflix. A clear advantage that this VPN has over all of the others in my list is its low price. However, my tests raised a disadvantage to NordVPN, which is that it is the slowest service on this list. That said, the connection speeds are still fast enough for uninterrupted video streaming and better than the majority of VPNs on the market. Despite being a cut price option, the NordVPN app includes extra security services, including one called CyberSec. This tool blocks ads and pop-ups, stops infected web pages from loading in your browser, and prevents your computer from becoming part of a botnet to launch DDoS attacks. Apps install on Windows, macOS, iOS, Android, and Linux and there are also browser extensions for Chrome and Firefox. You can set up the VPN manually on routers and set-top boxes. NordVPN gives each account a six-device simultaneous connection allowance. BEST BUDGET OPTION:NordVPN is your best choice if you don’t have much money to spare. The excellent security features and exceptional unblocking capabilities gets this cut-price VPN into my list of the best. NordVPN gives a 30-day no-fuss money-back guarantee on all subscriptions. CyberGhost offers sleek-looking apps that give access to VPN locations in 59 countries. This service has solid speeds, which makes it great for streaming video from UK websites to Spain – even in HD. You will be able to access BBC iPlayer and other mainstream TV websites, as well as Netflix UK and channels from all over the world, including ABC, NBC, and CBS. You don’t pay CyberGhost directly for the service, which means that the company doesn’t keep any identifying information on you. It also doesn’t keep any activity logs so there is no trace of you on the internet. Apps include an adblocker, a tracker blocker, and a system that prevents malicious websites from loading in your browser. These are all very useful extra security features come built in to the service. Apps can be installed on Windows, macOS, Android, iOS, Amazon Fire TV, and Amazon Fire Stick. The VPN is also available for Linux computers, routers, and set-top boxes via manual setup. The company gives each account a seven simultaneous connections allowance. STRONG PRIVACY:Take advantage of CyberGhost’s clever privacy features to disappear on the internet. Get into all mainstream UK streaming services and Netflix UK. CyberGhost gives all new customers a fuss-free 45-day money-back guarantee. Speed is very important when you are streaming video, particularly if those videos are traveling a long way, which is the case when you access online TV services in the UK from Spain. Tests show that IPVanish is one of the fastest VPN services, not just on this list, but in the whole world. You will be able to stream HD TV from the UK without experiencing pauses, poor quality, or gaps. That speed makes this a top choice for torrenters and Kodi users. IPVanish provides straightforward apps; you just need to pick a VPN location from a list that includes servers in 60 countries. You’ll be able to access many of the mainstream British TV video streaming services as well as others from around the globe. Apps run on Windows, macOS, Android, iOS, Linux Mint, Amazon Fire TV, and Amazon Fire Stick. The system also works for Ubuntu, Kali, and Fedora Linux, routers, and set-top boxes with manual setup. IPVanish gives each customer a simultaneous connection allowance of 10 devices. VERY FAST VPN:IPVanish gives you one of the fastest VPN services on the planet. Use it to stream video from the UK and for downloading. IPVanish offers a 7-day money-back guarantee. PrivateVPN offers fast speeds and gives access to servers in 59 countries. That location list includes the UK and this service can enable access to live and on-demand content from BBC iPlayer and other online UK TV channels. Speeds are more than fast enough for constant, faultless video streams from the UK to Spain. The app for the service presents you with a list of available locations. You just click on a UK server to get a British IP address and enable access to UK TV sites. Apps are available for Windows, macOS, Android, and iOS. The VPN can be set up on Linux, routers, and set-top boxes. Six devices can be connected at a time. PrivateVPN was created by Swedish privacy activists who particularly wanted to give the public identity protection when they downloaded entertainment with torrents. So the privacy procedures of this service are very strong. You pay a separate company such that PrivateVPN doesn’t need to hold any information about you. The company also refuses to keep activity logs. The customer support team is very competent and available via live chat during select times. PRIVACY VPN:PrivateVPN offers very strong privacy protection and will help you access British TV from Spain. You get a 30-day no-questions-asked money-back guarantee. Can a free VPN get British TV in Spain? Although these recommended VPNs are very easy to use, the work that goes into them is very complicated, and incurs costs. Yet, there are free VPNs around. How do these VPNs get away with charging when others give the service for free? The answer is that that free VPNs don’t give the same level of service. Most of them are cripplingly slow and make it difficult to stream video without lag of buffering. In any case, most of them are unable to bypass geo-restriction measures so can’t provide access to British TV video streaming services. Free VPNs still need to make money. They come up with a lot of sneaky ways to profit without giving a proper service. Many of them don’t include encryption, which means your traffic is completely exposed. Others force you to watch adverts before they will connect you and some track your data for sale to third parties. What British TV stations can I watch from Spain? There are literally hundreds of British TV channels online and you can even get them on your phone, so you can watch them wherever you are. BBC iPlayer gets you all of the BBC channels, including CBeebies for the kids. The ITV Hub enables access to all the ITV stations and All 4 gives you the Channel 4 family of channels, including E4, Vice, and Film 4. The Channel 5 website offers up Channel 5 itself as well as 5 Star, 5 USA, and 5 Spike. You can watch each channel live or work your way through catch-up TV on an on-demand basis. Aside from the basic channels, you can also access subscription service using a VPN. For example, UKTV Play gets you access to Yesterday, Drama, Home, Really, and Dave. If you subscribe to Sky in the UK, you can watch it online via Sky Go. Are VPNs legal in Spain? There is no law against using a VPN in Spain. It is perfectly legal. I tested the five VPNs on this list at a location in Tenerife and they all worked very well. I also tried the services on my mobile phone and I was able to watch British TV while sitting in the beachfront bars of Playa de las Americas and Los Cristianos. I have also used these VPNs on the Costa Del Sol from Malaga all the way down to Gibraltar and they all gave me good playback speeds for streaming on the BBC iPlayer and All 4. All a VPN does is divert all of your traffic through a server at the location that you choose in the app. The connection between your device to the VPN server is entirely encrypted, so no one intercepting the transmissions can tell what sites you are connecting to or what content is returning to your computer. When the VPN server sends your requests on to the TV website for a video, that request carries the IP address of the VPN server. So, if you choose a location in the UK, BBC iPlayer, for example, receives your request for a video from the VPN server’s IP address in Britain and not your real IP address in Spain. The VPN server passes the returning video onto your computer. This is how VPNs get around the location checks implemented by these video services. Not every VPN will work, so it is a mistake to just do a search in Google and pick the first service that appears in the results page. You run a strong risk of being ripped off. This is because British TV websites know about VPNs and try to block any request delivered by one. BBC iPlayer is particularly difficult to get into and very few VPNs have the skills to evade detection there. When you travel, you rely on the free wifi services offered by hotels, bars, and transport hubs. You aren’t using your own wifi router when you are in Spain, so you can’t really trust the security provided for your connections. It is great to go out to a beachfront bar, look at the sea, enjoy the heat, and watch Eastenders on your phone or tablet while enjoying a beer. However, connecting to those bar wifi services is a risk. An increasingly prevalent hacker trick these days is to set up fake wifi hotspots. When you connect to one of these seemingly genuine hotspots, you are actually connecting to the hacker’s computer. The hacker connects his computer to the real wifi hotspot and passes through all of your traffic, so you will actually get online. However, while all of your data passes from your device to the internet, the hacker gets access to it. The hacker’s computer will also be able to intercept and alter or replace all of the information that comes in from the internet to your computer. The wifi signal is protected by encryption. However, the key for the cipher is decided by the wifi hotspot, which is controlled by the hacker. So the hacker will be able to decrypt and read all of the information you send. This could allow the hacker to capture things like your bank details and your username and password for a whole range of online services, including your email and your Netflix account. The VPN connection is entirely protected by strong encryption. The key for that encryption is negotiated between the VPN app on your computer and the VPN server. The hacker isn’t able to perform what is known as a “man-in-the-middle attack” because the session establishment procedures require both the VPN app and server to prove their identities, which the hacker can’t fake. So even though the hacker will be able to crack the wifi encryption that is supposed to be protecting your connection, he will just uncover a stream of unreadable characters because the VPN encryption will still be in place. You may get tired of watching TV on your computer and it is even harder to enjoy a film or drama on the tiny screen of a phone. You don’t have to put up with that because you can send that stream to your TV. If your apartment complex or hotel has a wifi system, you can use a system called “casting” to forward the videos that you stream from the UK on to the TV in your room. The most well-known casting system is called Chromecast, which is produced by Google, but there are other systems out there. So, make sure you get a VPN before you go to Spain. When you get there, connect to the BBC iPlayer and cast CBeebies onto the TV to keep the kids quiet while you unpack. 14 Can a free VPN get British TV in Spain? 15 What British TV stations can I watch from Spain? 16 Are VPNs legal in Spain? 9 Can a free VPN get British TV in Spain? 10 What British TV stations can I watch from Spain? 11 Are VPNs legal in Spain?